Creating tables that use stumps for pedestals or slabs for tops has been around for a while now. These pieces usually go in the category of rustic furniture but they have an attraction for some because they put on display a chunk of raw nature. Polish up a redwood slab, pour a thick acrylic finish on it, stick it on a stump, and that’s the cat’s meow. Admirers can always be found, although I can’t say I am one of them. The famous maker, George Nakashima, showed a more sensitive approach. 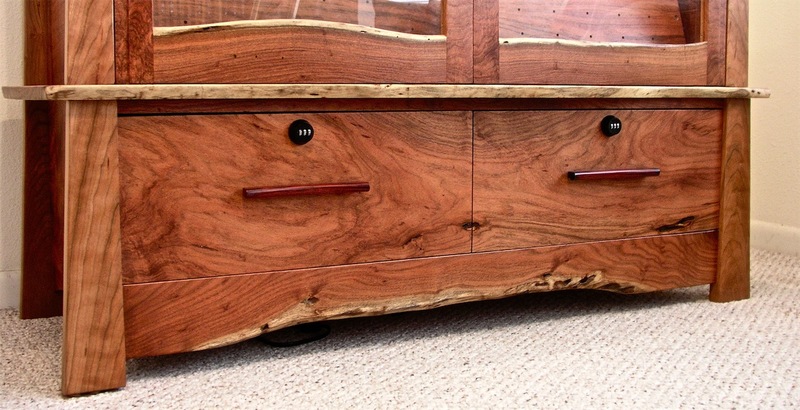 He carefully chose highly figured natural edge timbers that he incorporated into thoughtfully designed, skillfully crafted pieces of furniture that are now highly sought after by collectors. His reverence for the material reached an almost spiritual level, and his influence can be seen in the work of contemporary makers who continue to incorporate natural, “live edge” boards and slabs into their own work. In fact, natural edge furniture seems to be all the rage these days. I asked my wife if she understood the why behind this popularity, but those wiggly, organic edges don’t really resonate with her. I think it is a way for city dwellers to connect with a bit of the natural world and bring it into the urban environment. I like a touch of that naturalism myself, but since I live and work in the country, surrounded by nature, and work primarily in solid wood, I already get my fill of the raw, debarked edge. 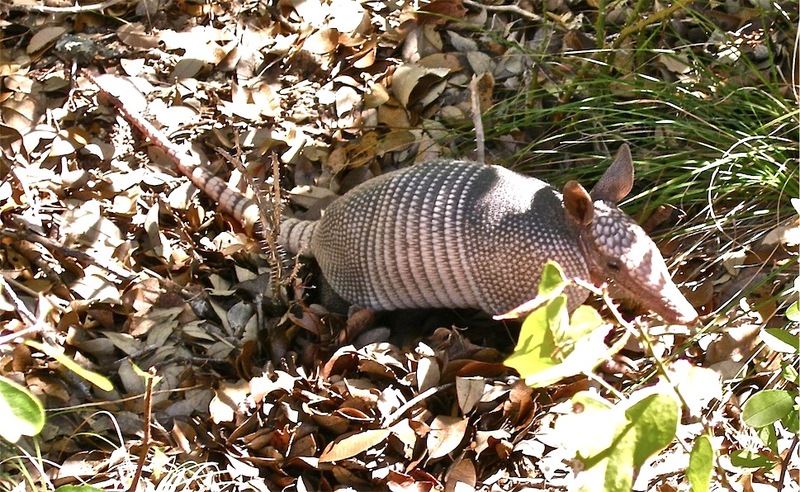 As I write this post I think there is a little armadillo on my porch drinking water out of the cat’s bowl and a wren hatching her eggs in one of our hanging baskets. Along with beautiful figure and color the natural edge mesquite also offers knots, checks, and insect holes. The slanting vertical board below the interior shelf has holes drilled in it to accept metal pins that will support hand guns for display. 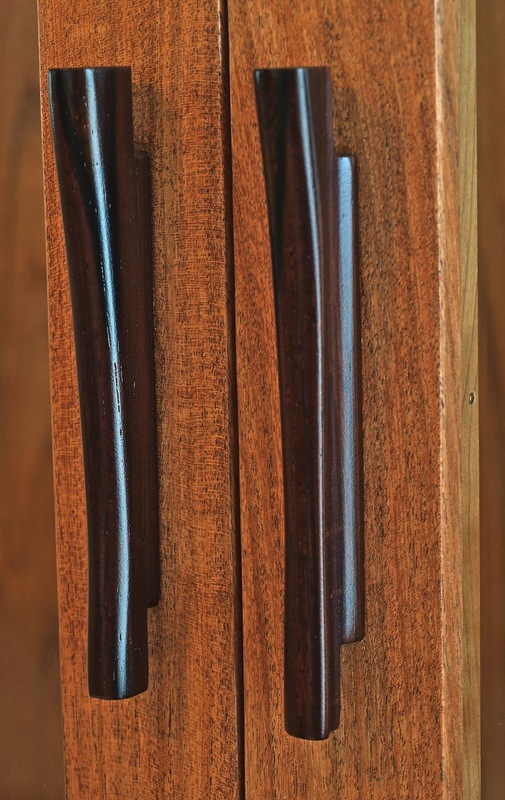 Drawer and door pulls were sculpted from cocobolo. 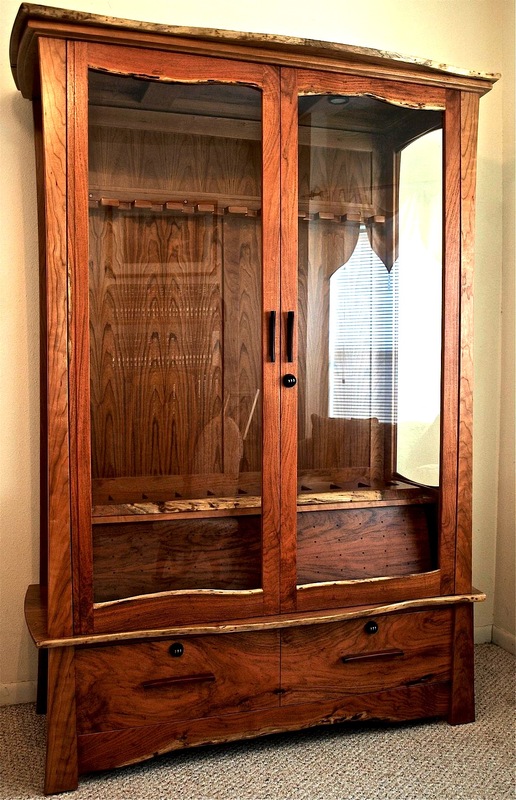 The upper section of this cabinet is put together with unglued interlocking joints so that the top can be lifted off, and the side sections can then be separated from the back. In other words the entire cabinet can be broken down into smaller sections that make it easier to move this piece. It can be assembled or disassembled by two people in about five minutes time. 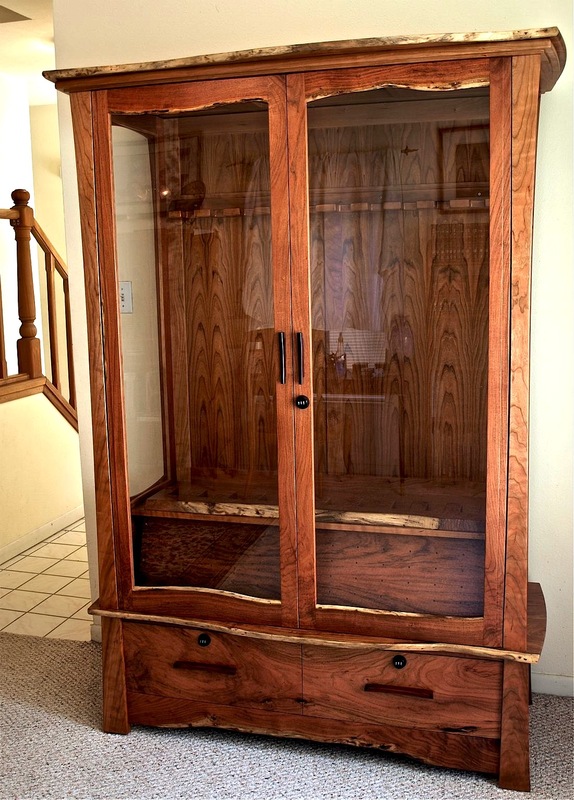 The couple who commissioned me to build this cabinet liked it so much that they have asked me to make a new one just like it for another family member. 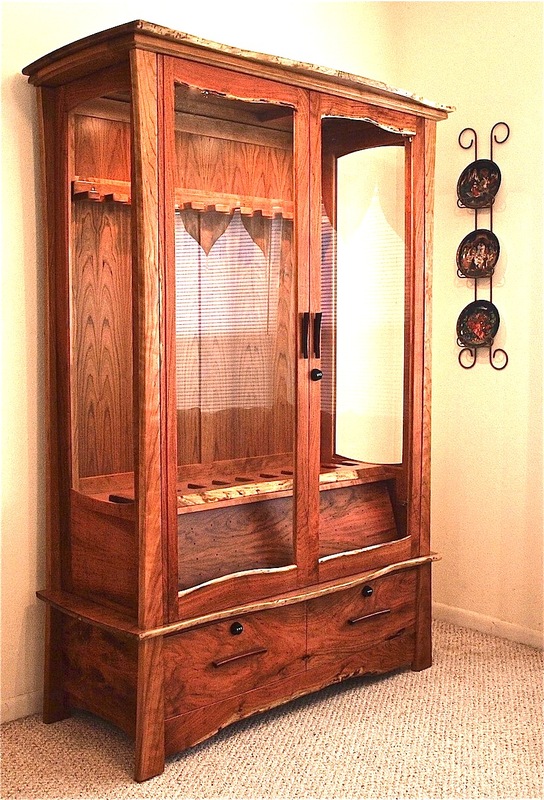 To see more of my furniture, please visit my gallery page. Oh, here is that armadillo I mentioned. 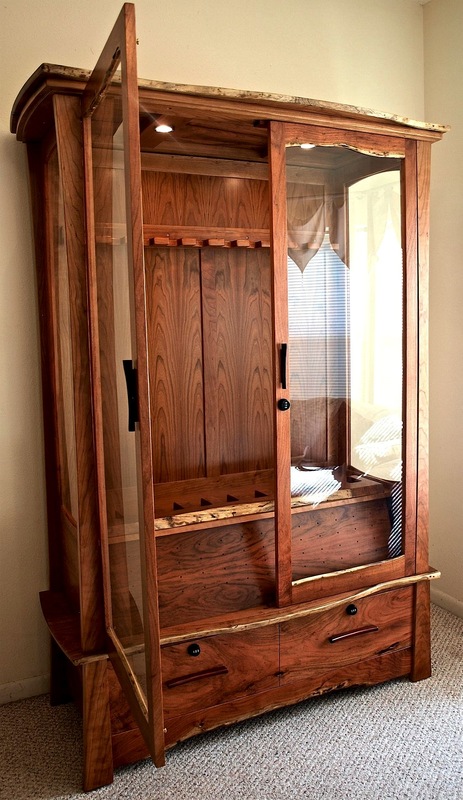 That is the nicest Gun cabinet I’ve yet seen. What a great use of the wood. When I lived in Arizona, I always used Mesquite and Iron Wood when I could get large enough lumber. Thanks so much for taking the time to comment. 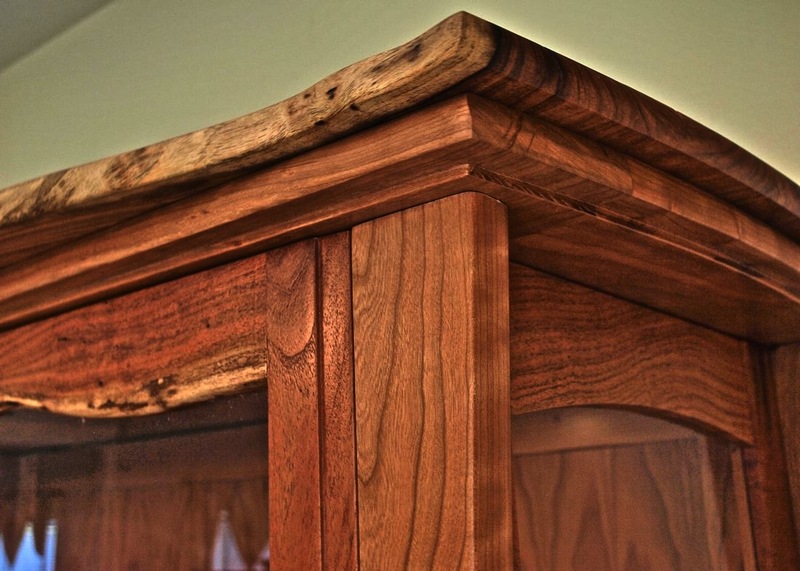 I enjoy the color, beauty, and even the natural defects in mesquite. 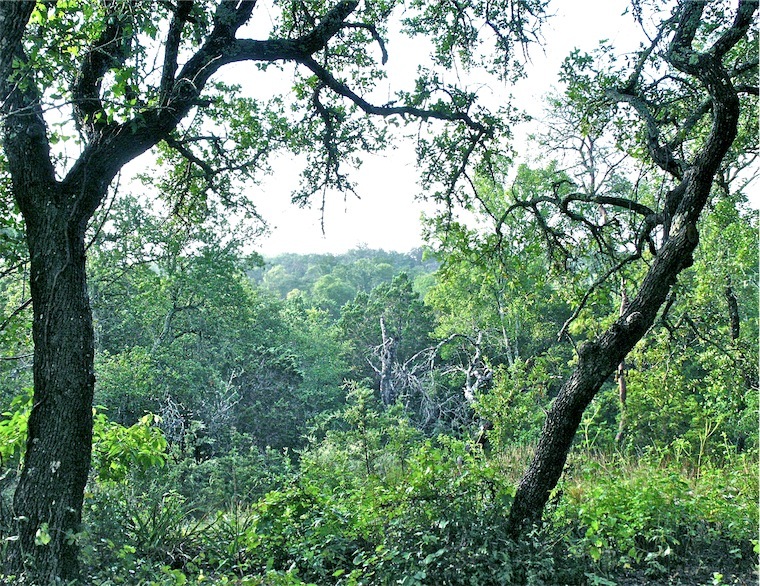 A few years ago Texas A&I University tried farming mesquite- planting, watering, etc. They got nice straight trees, but the lumber was very plain and boring. I guess those weather extremes most mesquite goes through here in the Southwest is what imparts character and beauty to it. All the best! Beautiful!!! You’re truly an artist! I love the color, it’s really manly 🙂 By the way, do you make other furniture aside from gun cabinets? I want to makeover my patio and I want a unique wood chairs. Please let me know. Thank you very much for commenting. 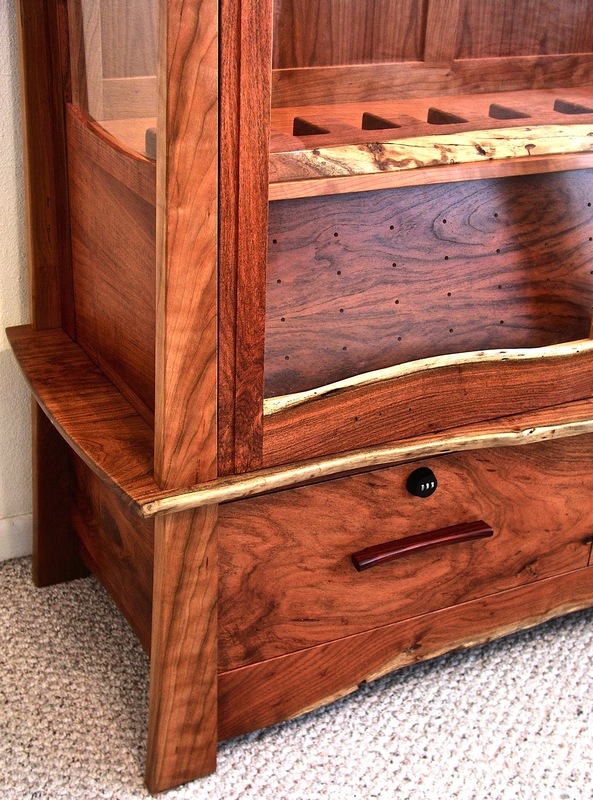 I have been making every kind of furniture imaginable in wood for the past 30 years. Please visit my website to see more examples of my work. I would love to discuss a possible chair for your patio. Please email or call at your convenience. very same area of interest as yours and my users would really benefit from some of the information you present here. You are certainly welcome to quote from any of my posts. Would love to see your blog. Can you provide a link or address? Thanks.